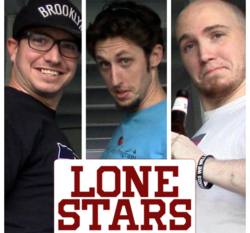 Lone Stars is a group of three Texan Natives who love games and humor, and seek to intermingle the two. They can most easily be found at LoneStarsLP.com with their daily Let's Play series. Fred Wood - Fred's a bit of a jack-of-all-trades with a drive to create web content. When he's not recording The Bancast or editing Lone Stars, he can often be found developing video games or drawing Sure to be Ban'D. Forrest Cobb - Forrest is an environmentally conscious fan of the arts with a penchant for being social. He's creative, funny, compassionate, and some day? He's gonna save the planet. Los Ferrand - Los has a passion for journalism that is only matched by his strength as a comedian. He's hilarious, well-spoken, and easily angered. That's our Los.